In Jewish tradition, leaven was associated with sin and also the unleavened bread they ate in the dessert in their exodus from Egypt. Jesus flips the traditional imagery in this parable. While instilling in the apostles an understanding of how God’s eternal purpose will be carried out through the apostles, and the church today. What godly transformation is happening within your soul? What is our responsibility in regards to the purposes of God? Do you know your vocation? Do you feel equipped? How are you preparing yourself to better serve God? Looking back at the expansive growth of the church in the first century, what questions and convictions do you have for this day and age? How are you making yourself ready to receive, understand and nurture the good seed in the soil of your life? What do you anticipate will happen to you in the last days? Photo: Sourdough tastes delicious. 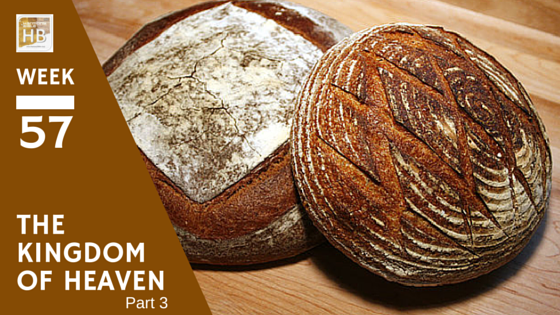 This recipe not only helps us understand this parable, but it turns out some amazing homemade sourdough in about a week. This set of Jesus parables have been filled with possibility and warning. Yet this one kindles thoughts of vitality, growth, and sweet aromas coming from the kitchen. Some parallel Luke 13:20, 21 with this verse, but Thomas and Gundry place it in Section 110 follow the timeline of the preceding verses of Luke (about 9 months later) in which Jesus tells the parable of the man who planted a fig tree. See also Mt 25:1-13 and the following passage Mt 13:36-43 in which he explains the parable of the seeds. Throughout the Bible leaven is a picture of sin (Heb. Se’or/Gk. zyme), 98 times (78 OT/23 NT). Some scholars (like Pink) believe that the leaven in this parable refers not to something good but sin. However, once before (Lev 23:17 in the Harvest Festival) leaven had a connotation of abundance and celebration. 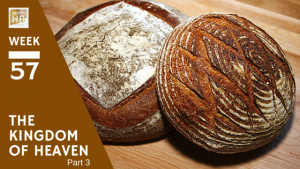 We’re convinced that Jesus uses leaven here as a positive image, aiming to impress on the apostles the way the spirit of God works through the church and causes its expansive growth! Jesus says “a woman” as it was customarily the work of women to ferment the flour, knead the dough, and make the bread. We must be careful when reading parables not to carry them too far. It is a teaching tool of the author and orator meant to convey the main point. Some people carry this metaphor too far suggesting if the church is the wheat then the Holy Spirit is a woman (female). It doesn’t say that as if it did the church would also literally be wheat/dough. It seems that the following set of parables (Sections 64 h,i,j,k in Matthew 13:44-53) Jesus is speaking only to the disciples. We have another transition here from when Jesus is reaching out to the crowds and still spending more time with his disciples (as in between Mt 13:9 & 10). Matthew is most likely inferring that they returned to Peter’s house (Sect 43). Those who would like to take part in the evangelistic mission bringing people to Christ and making disciples can begin at home, in their neighborhood. If your gifts are in another aspect of ministry remember to keep the main thing the main thing – Christ is reconciling the world to himself, and we have been given the ministry of reconciliation – charged to fulfill the Great Commission. Nothing short of this will suffice. We’d suggest take along a digital or print copy of the Harmony of the Gospels and begin making disciples as you have learned through this study so far. The Gospel need not begin with the news that people are doomed to hell without Jesus. There are many messages which Jesus used to touch the wound (the entry point) of the person with whom you are sharing the Gospel. Listen to this podcast by Missio Alliance to learn more about this concept. One popular booklet that conveys the classic message is “Knowing Him Personally” produced by Sonlife which can be viewed online or you can order a packet of 25. Most important is to come to people with a clear understanding of how your life was/is-being transformed for the better and come in the power of the spirit. sing wise words and authority won’t get you as far as speaking to the needs of the person to whom you are speaking (Galatians 4:13; 1Cor 2:4) that is come with Faith, Hope, and Love. Disciples are also needed in un-reached people groups and those in the last frontier cultures around the world (50 largest unreached people groups around the world). Download this chart representing “22 Centuries of Evangelism and Church Growth” by Gordon Conwell.